Murder mystery games are based on sets of clues that are progressed by "detectives" who examine clues to eventually solve each case. The murder of 6-year-old JonBent Ramsey remains unsolved despite being one of the most polarizing cases within the past 50 years. Murder mysteries were first added to film in 1900. The first murder mystery movie was a Sherlock Holmes film. Alfred Hitchcock is probably the most known film director to create murder mystery films. Murder mystery riddles are for people who love to play detective and who like to use a series of clues to try and figure out who murdered who. 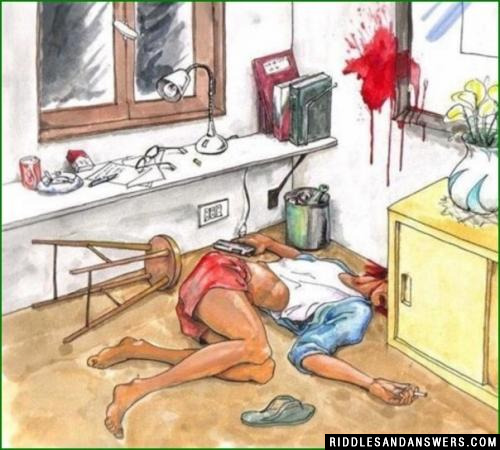 The murder mystery game is believed to have originated in the 1800's allegedly based on a series of killings called the Road Hill House Murders. The board game 'Clue' is one of the most popular murder mystery games to ever reach North America, and it is believed to have a huge influence on many fans of this complex hobby. Our collection of shockingly good murder mysteries can be used in almost every situation related to the popular murder mystery theme. Think that you have what it takes to be a good detective? Test out your mental sharpness with some of the best mental puzzles we have on our site. These questions are for an older crowd, and probably shouldn't be viewed by children aged 13 and under alone. A girl and a boy were out one night. 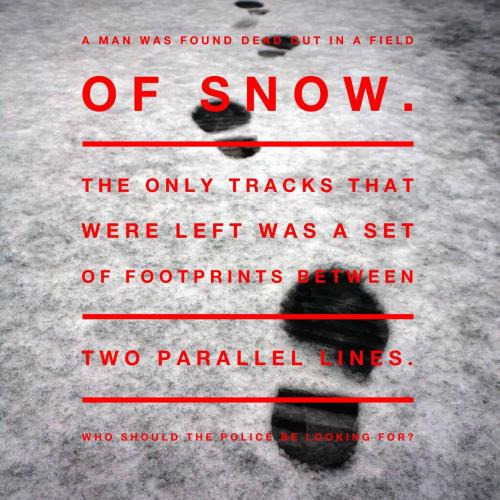 They were in the woods, and they saw 3 men hunting. Next day the girl and boy were found dead. Why is this? It was Halloween night and they were dressed up as deer. There was a very rich family, they lived in a big circular house. They had a maid, a butler, and a gardener. The parents were going to a party, so they tucked the younger kids into bed and kissed them goodnight and said goodbye and kissed the older kids goodnight. While the parents were gone the butler was feeding the older kids, the maid was dusting was dusting the corners, and the gardener was watering the plants. When the parents came home all of the kids were dead. Who killed the kids? 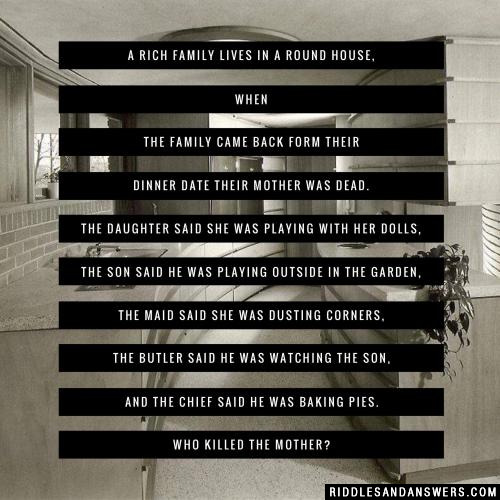 The maid did because she said she was dusting the corners, but it's a circular house , so she had to be doing something else, which was killing the kids. A guy and his wife went to the store and left their three children at home. When they returned, all of his children where dead. The au pair said she was reading the newspaper. The maid said she was making the beds, and the butler said he was putting away the groceries. Who did it? The butler because the parents went to the store to get the groceries. Therefore, they were out of groceries and there was none to put away. Ray Whitcombe is found dead in his office at his desk. The police have narrowed the suspects down to three people: Mrs. Barbara Whitcombe, Ray's wife; Mr. Jason McCubbins, Ray's business partner; and Mr. Harold Nichols, Ray's best friend. 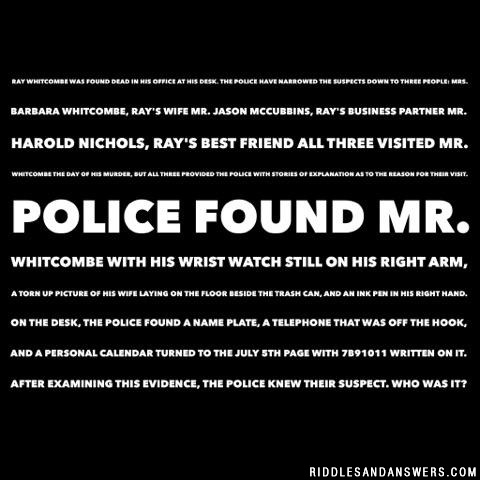 All three visited Mr. Whitcombe the day of his murder, but all three provide the police with stories of explanation as to the reason for their visit. Police found Mr. Whitcombe with his wrist watch still on his right arm, a torn up picture of his wife laying on the floor beside the trash can, and an ink pen in his right hand. On the desk, the police found a name plate, a telephone that was off the hook, and a personal calendar turned to the July 5th page with 7B91011 written on it. After examining this evidence, the police knew their suspect. Who was it? Jason McCubbins, Ray's business partner. The calendar is the clue to solving this murder. The police realized that since Mr. Whitcombe was wearing his watch on his right arm, he must be left handed. But the pen was found in his right hand. Realizing that the number on the calendar was written in a hurry and with his opposite hand, police matched the written number with the months of the year. So the B was an 8, thereby giving us 7-8-9-10-11: July, August, September, October, November. Use the first letter of each month and it spells J-A-S-O-N.
By seeing the image below, you need to figure out if it's a Murder or Suicide? I have three theory based on which it can be either Murder, Suicide or Accident. Reason1 : If it's a suicide then person must have waited for the Cigarette to end. Reason2 : Blood is spattered on the right side and the pistol is also on the right side. which seems pistol is planted at the end. Reason1. The lamp was switched off and glasses were removed which indicates she done writing(probably suicide note). The murderer does not care about switching off glasses or removing glasses. Reason2: The blood was just on the wall at the height of a person. If it's a murder the blood must have been scattering around. Reason3: Burning cigarette and alcohol indicated depression level which often is the reason for suicide. It's must be an accident. The girl was writing using the pen and suddenly she heard a sound. She must have a gun for safety which she takes out of the security. As a preventive measure, she switched off the light so that she can't be seen in the dark. Also removed the glasses as they are of no use in the dark. After a while, she realized that it's just a sound. So to calm her down she drinks and also lights a cigarette. suddenly she slipped and try to hold stool but failed and forced her head into the wall and died. The man bought only one way ticket for his wife whereas he bought two way ticket for himself. It means that he was sure that he will be returning alone. 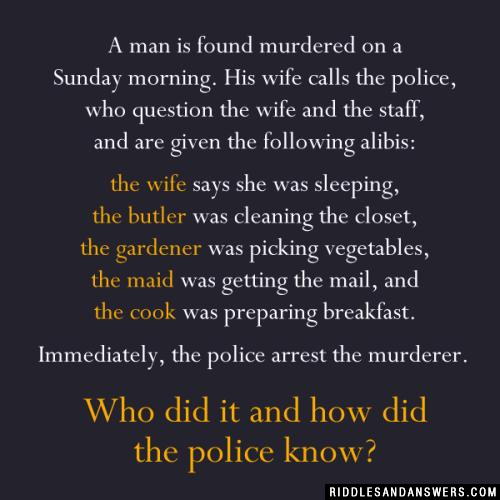 Can you come up with a cool, funny or clever Murder Mystery Riddles of your own? Post it below (without the answer) to see if you can stump our users.